Actor Fawad Khan is celebrating his 36th birthday today. Fawad's fans are making his birthday even more special with their special wishes. Nothing could have been better for Fawad than to receive such a Khoobsurat birthday wish from none other than actress Sonam Kapoor. 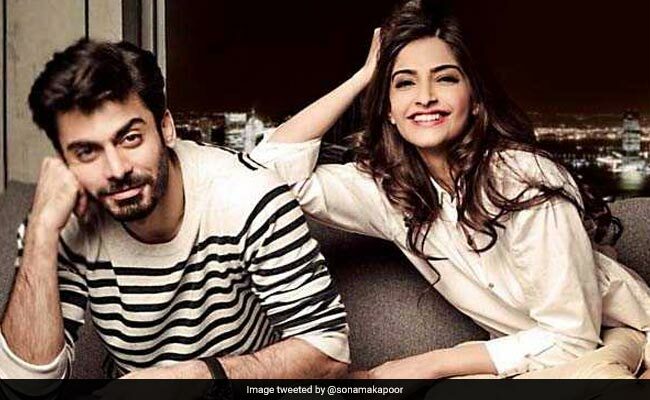 Sonam tweeted a heartfelt birthday wish for her Khoobsurat co-star: "A very Happy Birthday Fawad! Hope you receive all the joy and happiness on this special day!" Sonam dug out an adorable picture of herself with Fawad, which seems to be from the sets of their film. Fawad was born in 1981 in Karachi. He starred and TV shows such as Zindagi Gulzar Hai and Humsafar, which gained him immense popularity. In 2001 Fawad made his television debut in Jutt and Bond and was later featured in 2008 TV series Satrangi. In 2011, Fawad Khan co-starred Mahira Khan in the romantic drama Humsafar, which was a hit. He has featured in TV series, including Daastan (2010), Akbari Asghari (2011), Kuch Pyar Ka Pagalpan (2011), Zindagi Gulzar Hai (2012) and Numm (2013). Fawad Khan's bollywood debut was with Sonam Kapoor in Khoobsurat. The movie didn't do well at the box office but Fawad and Sonam's chemistry became a hit. Fawad also won a Filmfare award for Best Debut male for the film. Later, Fawad featured in Kapoor & Sons, co-starring Sidharth Malhotra, Alia Bhatt and Rishi Kapoor and in Karan Johar's Ae Dil Hai Mushkil, co-starring Anushka Sharma, Ranbir Kapoor and Aishwarya Rai Bachchan. Sonam Kapoor is currently prepping for Veere Di Wedding, directed by sister Rhea Kapoor. The film also stars Kareena Kapoor Khan and Swara Bhaskar. Sonam also has Akshay Kumar's Padman in the pipeline. We wish Fawad Khan a very Happy Birthday.